Eric's Review - This is a little better than Gladecover Scout. Sure it costs one more, but the power is boosted and it has built in reach. What's not to love? Bottom Line: Limited and Standard is good. I'll even consider this in Modern Bogles. Devin's Review - This Card looks horrible in limited, but i could see a hexproof deck taking advantage of this in constructed. Devin's Review - This card is amazing, it will be an allstar in limited and I wouldn't mind throwing this into an EDH deck. Bottom Line: EDH, and I think Standard even. Bit hard to work with in Modern, but crazier things have happened. Devin's Review - It is alright, pretty good solid removal in limited, but in any constructed format there are many cards that do this same affect but better. 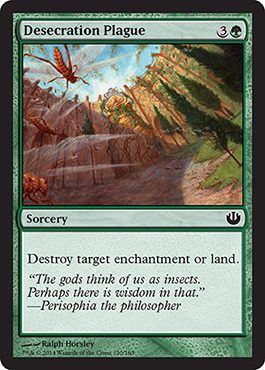 Bottom Line: Some sort of Jund "destroy everything" deck maybe in Standard? 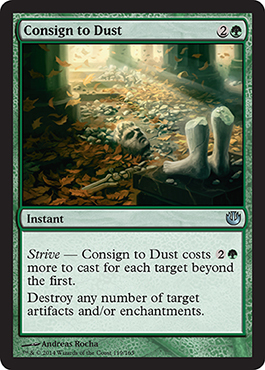 Devin's Review - A green demolish, and we see how good that is in limited right. Bottom Line: Many applications, mostly focused on EDH, maybe Standard. 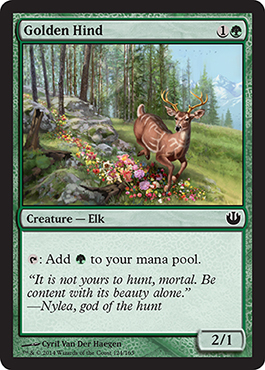 Devin's Review - I love this card, and i cannot wait to play this in my standard deck. In EDH i this is so playable like all other cards with this effect. Bottom Line: Seems good in Standard. Maybe in Limited. I'm still not sold on Constellation working in Limited. Devin's Review - This is really good, draw in green is pretty rare especially one that is this good. Seems great in limited and i could see this easily seeing play in standard. Eric's Review - It's not too bad, other things are better, but then we don't have Evolving Wilds or Terramorphic Expanse in Standard, now do we? Bottom Line: One of the better cards in the Font cycle. I'm not big on the Black or Red ones, but the rest seem okay. 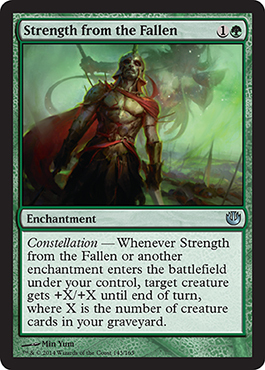 Devin's Review - Not to bad in limited, basically a rampent growth that you can play a turn earlier and triggers constellation. Eric's Review - This is Limited for sure. 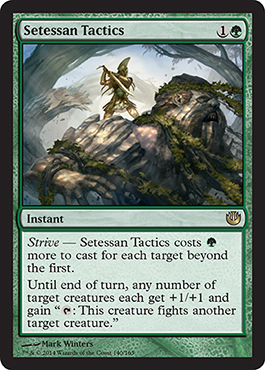 And budget Standard for people without playsets of Sylvan Caryatid. But this is a bad card. One more mana gives it +1/+0 versus Elvish Mystic and a 0/3 Hexproof wall. I don't see the appeal. Bottom Line: I would not play this. Maybe if I'm seriously in need of mana dorks in EDH, then I'd consider it. Devin's Review - This is great mana ramp, plus it has a body that isn't to bad. Playable in standard and limited. Eric's Review - I'm just going to go ahead and say I'm not a big fan of these Constellation cards... It's okay, but certainly not great. Bottom Line: Limited only if that. Devin's Review - I have never had a chance to play with a "unicorn" before so i have no idea how to evaluate this card. Though i do know that this guy has huge body at it's cost for limited. Eric's Review - It may be a bit steep, but then look at what it does. Also consider Corpsejack Menace and Vorel of the Hull Clade are still Standard legal. Just imagine for a bit. Bottom Line: Yeah, this is good. 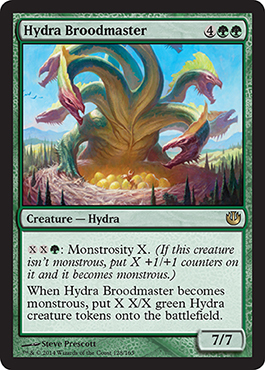 Hydras always seem to be good and we have an absurd number in Standard right now. 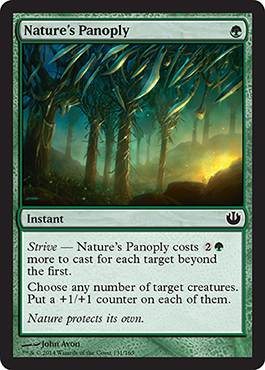 Devin's Review - 5 mana for a 4/4 is under what we would expect in the modern splashy creatures magic. Though this card has the little surprise of being able to double its body for 4 mana (and you can use combat tricks to make him even bigger). 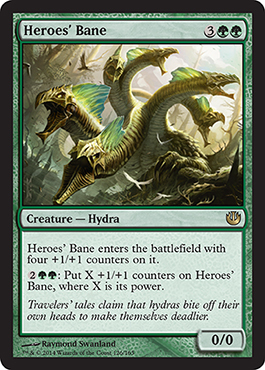 Seems amazing in limited and EDH. Eric's Review - Okay, Trample isn't bad, especially on a 5/5 for six mana. I guess this is okay in Limited and not quite a stretch in Standard. Bottom Line: Limited, maybe Standard. 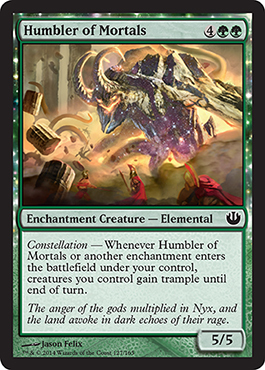 Devin's Review - This is pretty good in limited, being able to give your entire team trample when it comes out can really mess up how your opponent expected to play. Eric's Review - Well, a 7/7 for only six mana AND you can add more counters and even make more hydras. This is great. Bottom Line: Standard. 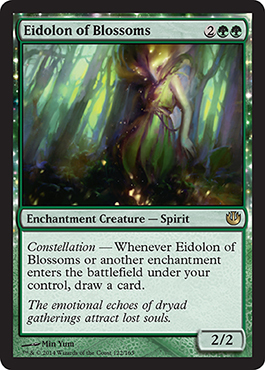 Mono Green Devotion. Or something. EDH too. Devin's Review - This card is fantastic overkill for my opponent. This card will destroy your opponent and then some. This will be super bomby in limited and i wouldn't be surprised to see this in standard or EDH. 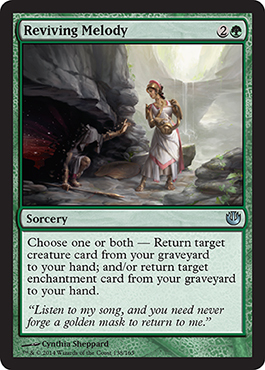 Eric's Review - Well, I think this will be a pretty good card to have, especially when you can draw a couple enchantments, place giant creatures in the graveyard, then pull them back out in Standard. This is good. 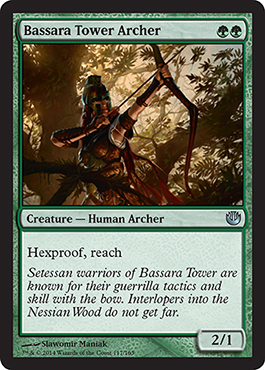 Bottom Line: There is a Standard deck where this is used, and I want to make it. Just after I get through Bant Strive. 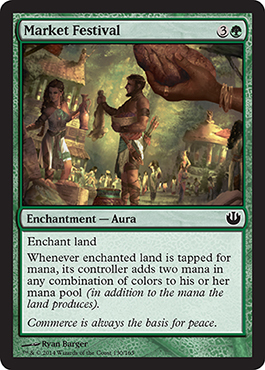 Devin's Review - That is a lot of card advantage for three mana in green. It lets you hopefully draw up to 3 cards (all enchantments) and will be great in the decks that want it and horrible in the decks that don't. Bottom Line: EDH, possibly Standard, definitely Limited. 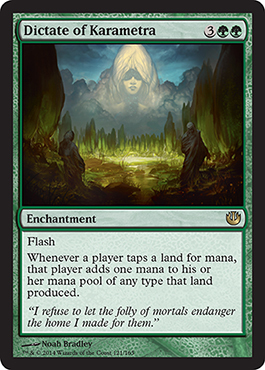 Devin's Review - More green mana ramp for limited and even a little in EDH. Eric's Review - Counters. I like it! Bottom Line: Standard, Limited, EDH, lots of things. 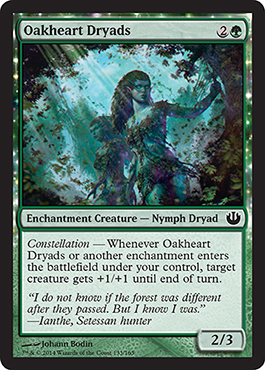 Devin's Review - Permanent growth and a heroic trigger in limited. Eric's Review - It's not quite Scry, but it could be useful, especially in Limited, maybe even in Standard. Bottom Line: Seems good, probably best for Limited. Eric's Review - This is more playable, but more for Limited I think. A 2/3 for three that gives creatures +1/+1 for a turn is decent. Bottom Line: Limited, maybe budget Standard. Devin's Review - Not to bad, but needs a lot of enchantments for this card to be good in limited. Eric's Review - Whoa, even more powerful. I like it! Not the mana cost, but the Heroic ability is amazing, especially for a common. Bottom Line: Standard maybe, Limited would be good though. 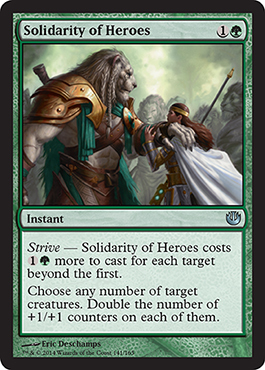 Devin's Review - Another huge heroic creature for green, and can't wait to play this in any Green heroic deck. 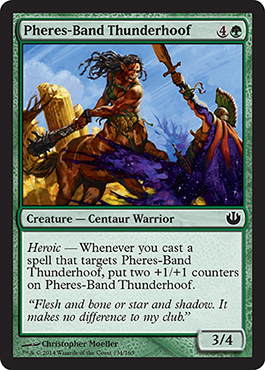 Eric's Review - Centaur tribal? 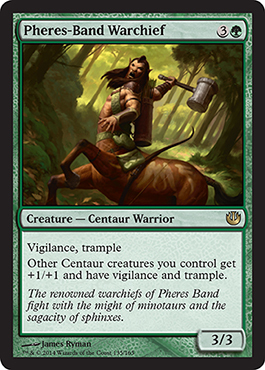 Devin's Review - That is a centaur lord that i can't wait to play in some casual deck with friends. 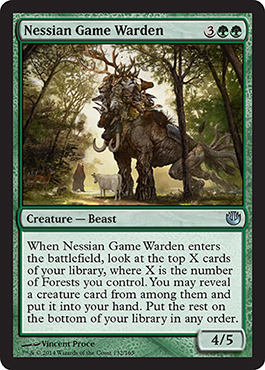 Maybe there is some kind of centaur tribal EDH deck and if there is then i am very upset this is not legendary. Maybe playable in limited and doubt will see any serious standard play. Eric's Review - It is just okay. Monstrous cost is too high, and four mana for a 2/4 with vigilance isn't so great. Bottom Line: Limited if anything. 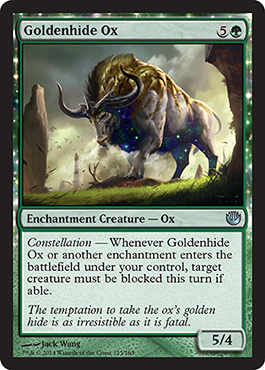 Devin's Review - Not that bad for a "pillarfield ox" though only playable in limited if at all. 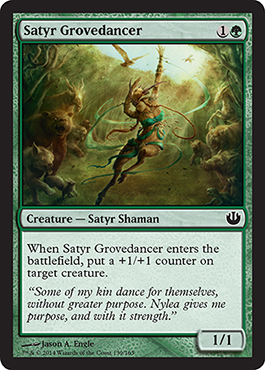 Bottom Line: It's a decent body in Standard, probably better for Green in Limited though. 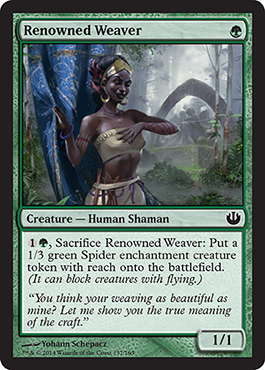 Devin's Review - I really like this card you can just do crazy stuff with it like block and then before combat sac make your spider, though this is only good in limited. Eric's Review - Seems good. I like the "Choose one or both/all" cards. They're cool! Bottom Line: Standard, maybe, EDH definitely. Eric's Review - And here we go with counters again. But hey, it could be a 2/2 or give something else +1/+1. Bottom Line: Good in Limited, maybe Standard? 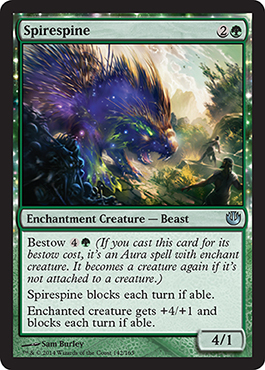 Devin's Review - It is a bear that can spread it's love, this will be really good in limited. Eric's Review - Maybe there is some R/G fight deck we should be looking at... With deathtouch! Bottom Line: Standard, Limited, EDH. Devin's Review - This is what they call green removal and this is a really good green removal card that can also hit heroic in limited. Bottom Line: Standard, Limited, EDH? Bottom Line: Limited is good, Standard is a maybe. Devin's Review - What an odd ability, though i really like this for aggro reasons though only slightly playable in limited. Eric's Review - Interesting... B/G graveyard shenanigans is getting better and better. Bottom Line: Standard for sure, maybe Limited? Probably not though. 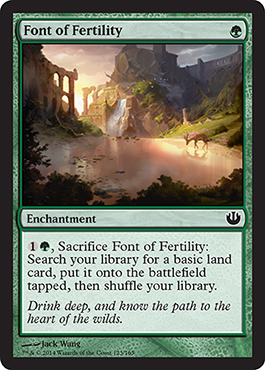 Devin's Review - I love this card, great for G/B dredge in standard and EDH though this is horrible in limited. Eric's Review - He's not bad, you just have to make sure you don't get hit while he's on the field... But at least is't only combat damage. Bottom Line: Seems decent. Possibly Standard? Limited is more likely. And EDH too. 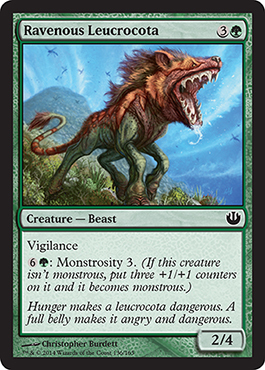 Devin's Review - This card is huge though this card seems to just want to be a meat whale to protect you from dying, though when you do have the chance to swing in with this guy you will feel great, this card could be great in EDH, standard, and limited.